Recently my wife and I moved to Augsburg. It was a move fraught with stress; not only was there the normal anxieties over moving to a new house, but because of the peculiar nature of German government employment, my wife and I had only two months to find our new home, organize the move and pack our belongings into so many cardboard boxes. July and August flew by in a whirlwind and it is only now that we seem to have found, as much as anyone ever can, a sense of order. Part of finding order has been exploring the city of Augsburg. This has probably been the easiest and most enjoyable part of the process, made even easier because it was the city my wife studied in and the first German city I spent any length of time in. One of things I loved so much about the first years spent in Augsburg was how young and vibrant the city seemed. Augsburg University is fairly large, and the city center seemed to act as an extension of the campus. Everywhere seemed to offer student discounts, the fact my German was non-existent didn’t seem to faze anyone and no matter what night of the week it was, there was always some party or club night to go to. One place in particular stuck in my head for years later. The YumClub was memorable for so many reasons: the terrible name, the shots of vodka served with sachets of sherbet, but mostly for the all you could eat Haribo buffet table. It was simultaneously incredibly generic and yet somehow typified all my expectations about German clubbing. Whenever I remind my wife of the Haribo buffet, she shudders at the thought of how many germs must have multiplied within those open bowls of sweets, yet at the time it made so much sense. Coming back to Augsburg has been an interesting experience. Neither my wife nor I were naïve enough to imagine that everything would be the same, but it is nevertheless still of constant amazement to me how much my perception and experiences differ from our early years here. Augsburg is still a city of young people, however now I’m no longer counted among their number. Where students working in coffee shops used to say “Du” to me, they now use the more formal “Sie” which gives me the same feeling of distress as when an English speaking service worker calls me “Sir”. I should probably have realized I was getting older, when all my birthday cards started joking about being “over the hill” or extolling the virtues of grey hair, but there is nothing like a fresh-faced student in a cool beany hat politely enquiring “Wie kann ich Ihnen helfen?” to break the illusion that I’m forever young. The culture of the city also seems to have changed, but I have yet to work out exactly why those changes have occurred. Take for example the simple process of going for a pint. I could easily walk across the road and get a pint in the Irish pub, but drinking German beer in an Irish pub is the closest thing to hoisting a white flag and giving up on trying new things as I can imagine. Attempt to go anywhere else, however, and I’m confronted with the peculiar phenomena of table reservations. Sure, I’ve reserved tables in restaurants and I have also done so in pubs when special sporting events might require it but walk into some bars in Augsburg on any night and you will be confronted with small cards telling you that the table has been reserved and at what time. I recently walked into one place and found that every single table had a card, reserving spaces for 21.00. It was only 18.00 in the evening, but simply deterred anyone from coming in. People would walk in the door, see all the tables were taken and walk back out. At first, I simply assumed it was only me that was riled by it but walking home on Friday I overheard a group of irate students complaining that they couldn’t go anywhere in Augsburg without having reserved a table. This might just be the way things are done and I may inevitably have to accept casual disappointment with a typical British tut and shake of the head, but it still seems a bizarre concept. In other ways, the city is very much as I remember it. The great thing about Augsburg was and is the wealth of green spaces and the tree lined streets. Everywhere I go there seems to be streets upon streets that are lined with trees, giving the place a rural quality that few cities achieve. Especially in Autumn, the city is awash with colours. Granted we have reached the point in the year where all the trees unceremoniously dump their leafy payload, yet I don’t feel so bad about sweeping the leaves around the front of the house, knowing how amazing the city will look come spring. In the early years of living together, when my wife would ask if I still missed university, I would generally lie and say “No”. I thought that was a more appropriate answer for an adult, but of course I missed the late night drinking, the total lack of responsibility and the freedom sit in my pajamas at three in the afternoon, eating cold baked beans from the tin. I mean, that’s the dream…right? Frankly, now I can honestly answer no. Although it is nice to come back to the haunts of my student days, there truly is no going back to them. 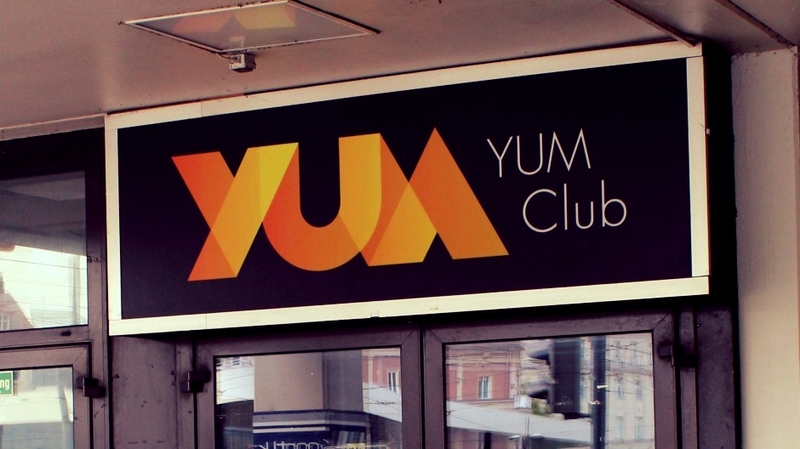 It was underlined two weeks ago, when my wife solemnly informed me that the YumClub had closed its doors for the final time. It is an end of an era, the nail in the coffin of my twenties and a welcome relief to those healthcare professionals mystified by the rates of Botulism among Augsburg students.